Numerous keen skiers are flocking in Osogovo ski centre for another downhill on the slope. All skiers and snowboarders enjoy the perfect weather and excellent ski cover in the resort. 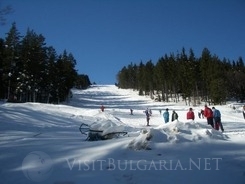 According to them, the winter attractions in Bulgaria should be improved and developed. The drag lift in the resort is operating since 1994 and is the only private drag lift in Bulgaria. The owners are already working for the development of the resort. Regarding to them, there should be an easier procedure for the construction of ski equipment, as the mountain activities are a healthy and a pleasant way to entertain tourists.